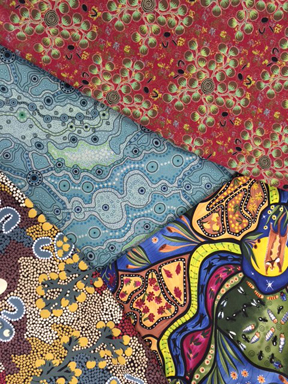 We received a large collection of Australian fabric last week. Some bolts are already gone so we've ordered another shipment. Here's a sampling of these unique prints. We've cut half-yard and fat-quarter bundles. We also have a book that introduces the designers of these fabrics and includes dozens of great ideas on ways to use it. 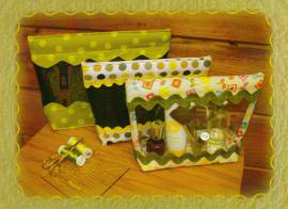 Our April Evening Make & Take features Judy Bryan teaching “Sneak Peek.” Make these cute zippered bags in the size of your choice and use either vinyl mesh or clear vinyl. 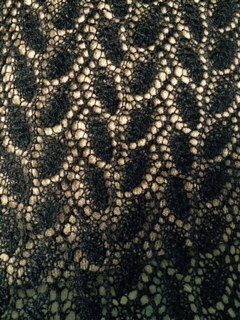 Embellish with ric-rack or the fabulous new ribbon we just received. Sign up today . . . only three spaces left. 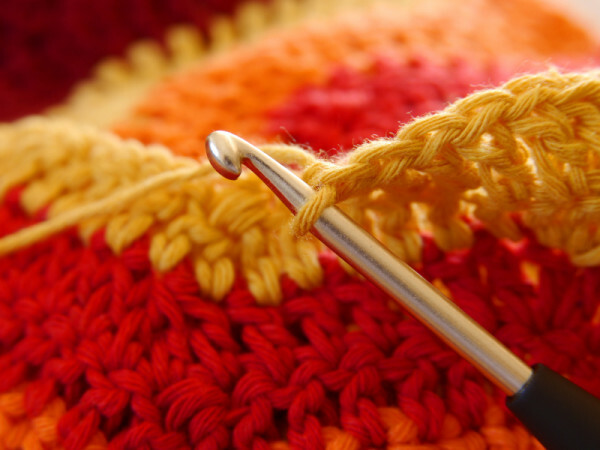 Are you ready to crochet? 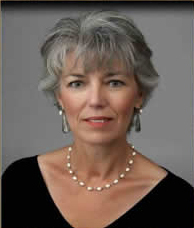 Guest teacher Karen Ragland will be your guide as you learn the basics in this two-session class. The class fee includes an Addi crochet hook and ball of yarn for practice. 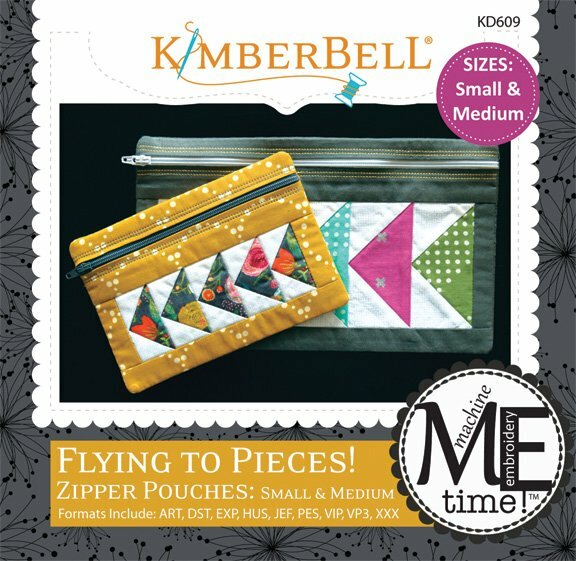 These in-the-hoop zipper pouches are PERFECT for organizing small items. The flying geese blocks stitch out with perfect little points and the entire pouch has a nice tailored look. 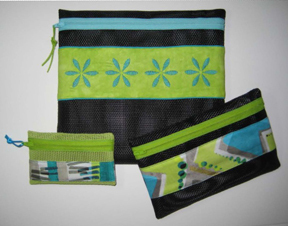 Each zipper pouch is lined and shows no raw seams. 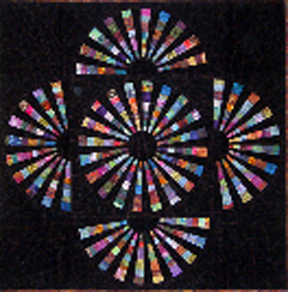 What a great way to learn or become more proficient at piecing in the hoop. Since embroidery fields vary for different brands and sizes of hoops, please be sure that the embroidery field listed above will be the right size for your particular hoop. Cindy Dahl will teach this class. Someone left three books here recently. They're not quilting books. If you think these might belong to you please call to identify and then come by to pick up. 970-565-7541. My guestroom has always doubled as an exercise room, but in my current home that bedroom is a tad small. A daybed was the answer. When I got ready to make the quilt, however, I realized it needed to be sort of an unusual size. None of the patterns in the shop quite fit the bill, so I created my own. 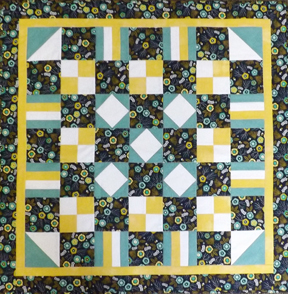 I knew I wanted something simple, and came up with 6-inch nine-patches alternating with 6-inch solid blocks, then put 1-inch sashing and cornerstones between the blocks. Easy peasey. The only tricky part was figuring out how much fabric I needed. Here's the formula in case you want to try this at home. 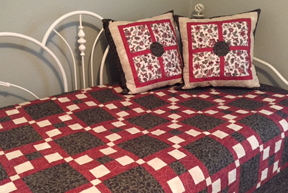 Once you have your quilt top design sketched out, count the number of pieces for each fabric, determine the size of each one, and then think in terms of how many strips (width of fabric - WOF) you need. For example, if you need (56) 6 1/2 inch squares you can get (6) 6 1/2 inch squares out of one 42" WOF strip (42 divided by 6.5). Then divide 56 by 6 and that tells you that you need 9.33 6 1/2 wide strips of fabric to cut the 56 squares (round up to ten of course). Ten strips times 6 1/2 inches is 65 inches of fabric. Divide that by 36 and you now know you need 1.8 yards of fabric. When designing your own quilt, it's wise to round up a little when buying fabric. In this example, 1 7/8 yards would be enough, but I'd recommend getting 2 or even 2 1/4 just to be on the safe side.